I do not feel the cuts on my hands until all the pieces [of the mirror] have been cleaned up, but this doesn’t surprise me; fear has a way of focusing my mind. What’s a little sting beside what my father will do if he finds the broken glass? I would like to stop to admire the new patterns on my palms, red streets on a map made just for me, but I must erase all traces right away. The blood would only lead them back to the glass, and the glass to the mirror. It is the way their minds work. In lines. So I find one of my mother’s cloths – the ones only she uses. I am pretty sure she doesn’t have them counted out. I know he doesn’t. Silver Salts follows the life of Lillie Dempster, a young woman from Saint John, New Brunswick (my home town!) who is orphaned at a young age by an outbreak of Spanish Influenza. As Lillie grows up, she eventually moves into an apartment with an alcoholic journalist and struggles to make her way in the world. Lillie’s life changes forever, though, when movie producer Ernest Shipman comes to town and “discovers” her as a perfect body double for silent film starlet Norma Shearer. After accepting Shipman’s offer, Lillie eventually travels to Hollywood, California to work for another native of Saint John, movie mogul Louis B. Mayer. The ensuing story volleys Lillie between the euphoric highs of movie stardom and the despair of realizing that by becoming a body double, she has potentially sacrificed her very existence in the eyes of the world. The cabbage smell hits her like a wall when she opens the street door. Some things never change, she thinks, no matter how many times you move. She counts the stairs. The light is burned out on the landing, but she can feel the lock easily enough, and the key slides in. Cabbage gives way to dust. She hears a mouse – no, bigger than a mouse – scutter across the floor. The electric power has been cut off, but the windows are not so dirty as to block out all light. Lillie tries the bedroom door. It still won’t open. How, she wonders, could it possibly be locked from the inside? On many occasions, I have begun to read books that make similar literary promises as the opening sections of Silver Salts, but these books often seem terribly winded after their first 50 pages. Blagrave’s book, on the other hand, maintains its vitality and keeps the reader rapt until its final pages. 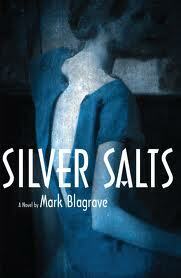 Along with its compelling overall arc, Silver Salts also showcases Blagrave’s keen abilities as a short story writer by including several (often humorous) mini-plots that create a beautiful balance for the reader’s short and long-term desires. This is not an easy balance to achieve, but Blagrave nails it. In an earlier post, I wrote that Michael Crummey’s Galore is the sort of book that Newfoundland has always deserved, and I equally feel that Blagrave’s Silver Salts is the kind that Saint John has always deserved. This is not to say that his book is stylistically similar to Crummey’s. It wouldn’t be suitable to summon Crummey’s outport mythologies and send them howling through the streets of The Loyalist City. No, Saint John’s character is found less in its local legends than in the stone of its buildings, less in its folkloric magic than in its dwellers’ buried anguish and flickering hope. Mark Blagrave’s Silver Salts conveys these latter elements wonderfully, and for my money, it sets the standard for anyone striving to capture my beautiful home town in fiction.